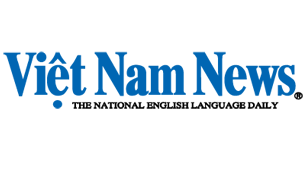 Bui Thi Nhan Hau gazes at herself in the mirror. Emotion washes over her as she puts on a white dress and practices for a performance with her choir this Saturday. This will be the first time the 11-year-old girl growing up from the SOS Children's Village will spruce up and raise her voice together with her friends on stage. The Miracle Choir, comprising 18 children from orphanages, was founded by Trang Trinh and her husband, South Korean tenor Park Sung-min. 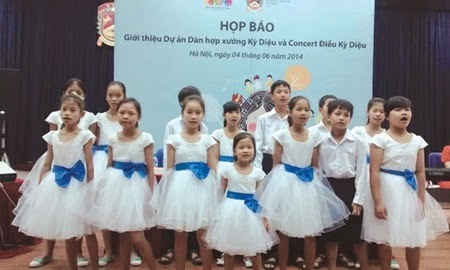 The first fund-raising concert, titled The Miracle, will take place from 5.30pm at the British Vietnamese International School (BVIS), 72A Nguyen Trai Street, Ha Noi, featuring the Miracle Choir . The BVIS choir, South Korean childrens choir, foreign troupes Africa Band and Shin Family as well as traditional musical instrumentalist Khuong Cuong will join the performance. 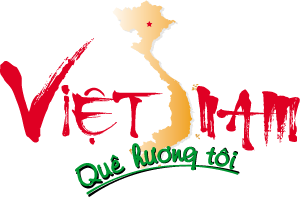 It aims to raise funds for the Miracle Choir and training courses on traditional Vietnamese musical instruments and symphony orchestra for children at orphanages. The idea to establish the choir, a free music training project for disadvantaged children, came to the couple after learning about El Sistema, a music education programme founded in 1970 in Venezuela by economist and musician Jose Antonio Abreu. Pianist Trang said she was inspired by Abreu's work: "Teaching children the beauty of music, and music will teach them the beauty of life." "The Miracle Choir aims to become a true family, where discipline and musical excellence are accompanied by love and personal transformation," she said. "Music and love must go hand in hand, and success will be measured by the smiles on the children's faces and the songs they sing." Tenor Park share his wife's passion for the project. They decided to target disadvantaged children at the orphanages in Ha Noi where the children had very limited knowledge of music. "Beauty in music originates from harmony which exists between melodies in a song, between instruments in an orchestra or between voices in a choir," he said. "Similarly, the beauty of life has its beginning in the discovery of harmony with oneself: body, mind and spirit, listening to it with respect and appreciation. On a wider level, it is the harmony existing between different people, between an individual and the world, nature, society and diversified cultures." "We expect that through learning music together, we can help the children discover themselves, enhance their belief in the future and bring them happiness," he said. The couple recruited some volunteers and went to the orphanages to introduce the Miracle Choir to the orphanage managers. They also called for financial and in-kind support, such as practising space, from their friends. They didn't receive permission from the orphanages' managers the first time round. "They didn't believe us when we spoke about the project," Trang said, "they didn't realise the importance of learning music." "On the other hand, they were worried when we told them that the children would leave the orphanage to go to the class every week," she said. "The beginning was undoubtedly difficult but it has been incredible to see our dream become a reality," Trang said. Since October 2013, the children have jumped on a bus every Sunday afternoon to join the choir. Hau still remembers the first day they came to class. They waited in front of the door and when it opened, the room was filled with the echoes of pianos and a resounding tenor. That was the first gift the two teachers gave to welcome the children to the class. Then lovely handmade name cards were given to them, made by the volunteers from cutting and sewing the days before. Their initial shyness soon faded away. In its place left music and love. The small room became filled with music and as time went by, they learnt more and more songs, including Silent Night, Heal the World and Elderweiss. Above all, they learnt to express themselves, to be confident in front of the public and live in harmony with others, said Trang. "True to our vision of making a difference in children's lives through music, we launched straight into singing, learning musical theory," Trang said. "As children learn to harmonise with each other through their voices, they also learn to listen and care for one another." Principal of the BVIS, Mark Sayer and his wife Sarah are regular guests to the Miracle Choir's class. Each time they bring the children gifts, including carols, food, book-grants and financial support. Sayer understood the passion and ambition of the couple, which he shared, to make the children's life better. "No matter who you are and where you are at, you can make a difference in the life of people around you," he said. In her students' eyes, Trang is a graceful and gentle teacher. Orphans like Hau say they always feel happy when they're at the class. "Sometimes, we have to practise over and over but I never get tired or bored," she said.